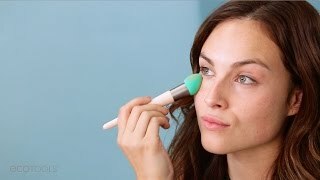 The PERFECTING BLENDER APPLICATOR is designed with EcoFoam® technology and a soft, flexible sponge on a bamboo handle to easily apply foundation and concealer around the contours of the face. Use sponge wet or dry. When using wet, squeeze excess water until damp. Use flat side of sponge to apply product, and the pointed tip to reach into for hard to reach areas such as eyes and nose. Apply in a tapping motion for an airbrushed finish. 1. Submerge the sponge under running water. Try not to fully submerge base of sponge in water so sponge does not detach from handle.